You must be a member of the Berlin Meat and Whisky Lovers Group to attend this activity. Would you like to join this group? as I will anyway go to Vienna to the Art Fair I thought some of you might want to join? Vienna is one of my favorite cities in Europe - very stylish and beautiful. Good food and nice places everywhere. 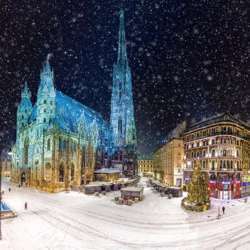 I have been looking for a hotel where we could stay - as a matter of fact very close to Stephansdom. Prices for single room differ between 50 to Protected content per night. A double room will be available for Protected content 250 Euro. Hotels are quite expensive in Vienna. If you want to book your own room please book it in the center of Vienna very close to Stephansdom. There is an Easyjet flight for 50 Euro only that I booked from Friday to Sunday. I will provide a program for dining, lunch, coffee, museum, shopping, a.s.o. You can join us or you can follow your own plans and meet up with us again at the suggested places. As I know already some landmarks - I will focus on nice cafés, restaurants, art galleries and museums. Please send me a message to confirm your attendance - you will have to book your flight and your room by yourself. After confirmation I will send to you the name of the hotel and the program. I will initialize a Whatts App Group for us - so we can communicate where we are and Whatts UP. For new joiners: Please send me a message to confirm your attendance. You are welcome to join us. Only those, who confirmed and were clever enough to cancel early enough my activities in the past if they could not make it, will get information about the trip. Again, no shows and frequent last minute cancellers are unwanted in my group(s) and will be ignored. Happy to see you and to have a wonderful week-end in Vienna.